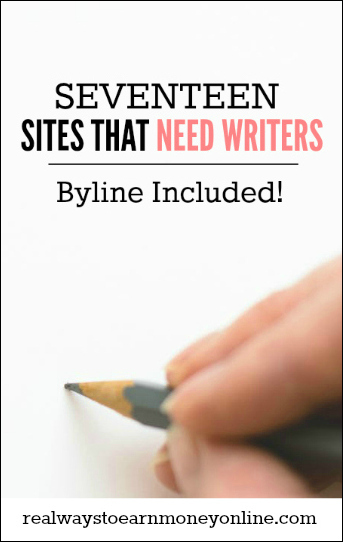 17 Sites Looking For Writers Now – Byline Included! Published April 14, 2017 By Anna T. This post may contain affiliate links. Regardless, I only recommend sites I've researched and/or used and trust. There are a lot of sites out there that you can do ghost writing for, and this is fine if you have bills you need to get taken care of. But a reader mentioned to me the other day that she is really interested in advancing her writing career, and to do this she'd like to find more places to write for that will pay her while also giving her full credit for her work. Pretty much all of the revenue-sharing sites will give you a byline, but unfortunately the money from these sites usually isn't enough to cover many bills — especially in the beginning. So I set out to do some research and find places you can write for that will pay you a flat fee for your work while also giving you credit for it. If you're pretty new to the writing world, you may be wondering, “What is a byline anyway?” Basically, this is just a a paragraph, or a few lines, of information about you that appears on articles you write. It gives you credit for the content, and ultimately makes it so you can use your articles in your portfolio since you are credited. Ghostwriters do not get bylines, and many, many content sites (particularly those lower-paying ones that use writers for SEO and link-building purposes) will not put your name on the content you create. And this is fine if you're OK with that. But it won't help you grow your writing portfolio. When you're writing out your byline, you'll want to be sure to include your name, a link to your website or social media profiles, and some interesting tidbits about yourself. Don't make it overly long — it needs to be just long enough to catch someone's attention, but at the same time you need to realize it will probably get skimmed over if it's a huge block of text. Cracked – They will pay $100 for your first accepted article, plus you will get a byline. They get a lot of traffic, so you would also get a lot of exposure. How Stuff Works – If you are accepted as a contributor for How Stuff Works (not easy to do! ), your name will go on your articles and you will have a short bio listed on their author page. IndieMade – You get your profile with a pic on the IndieMade contributors page. They are looking for writers with experience running a creative business. Listverse – Pays $100 for lists, and you will get an author byline if your list is accepted. Ranker – Another list-type site that is frequently looking for authors to write interesting content. Every article published by you will include your name at the top with a clickable link. When the link is clicked, it takes the reader to a page with info about you, plus links to your past work on Ranker. Bustle – Always on the lookout for interesting content. If your work is published, your name will appear at the top of your article in a clickable link. When clicked, the link takes the reader to a page with your photo and some info about you, and your past work. Wanderful – This is a women's travel website that will pay you $50 per post, plus publish your name on any accepted content. They are looking for well-written content on destinations and itineraries, travel tips, global issues, and women to watch. LovetoKnow – Every article you write has your name at the top. Clicking your name leads to your detailed “About Me” page. Matador Network – This is mostly travel-related content. All your articles will have your name along with a short bio at the end as well as a link to your other Matador content. Salon – This site publishes content on a variety of topics, and they accept submissions from freelancers. You will be paid and credited for your work if your submission is accepted. Skyword – Your name goes on all the articles you write for any of Skyword's properties. The Escapist – Online magazine paying $250 an article. The Expeditioner – Travel-related articles. They will include your bio at the bottom of each piece you write. Wow! Women On Writing – This magazine accepts freelance submissions. You will receive an author bio and you will be paid between $50 and $150 (depending on the type of article you submit) if your work is accepted and published. Writer's Weekly – If you have freelance writing experience and you can write about, Writer's Weekly may be interested in publishing some of your work. They also accept success stories. Pay is between $40 and $60, and you will get an author bio on your published articles. Want to Go Into Business For Yourself? Here's a Free List! This is the most profitable route to take as a freelance writer. You can get your own clients and set your own rates, which you cannot really do with sites like those listed above. A six-figure income is not outside the realm of possibility when you're running your own business. Salon and About are pretty high level…I’d guess you’d need to have serious credentials or an exceptional portfolio to get anywhere close to them. My experience with sites like Ranker or Listverse is that its barely worth it after all the hoops they make you jump through + time invested to get an article accepted. Actually view this as a big hurdle for freelance writers, any thoughts? Recently I’ve gotten a lot of responses to applications where they ask for some complicated unpaid test. If you work with say 5-10 clients that are constantly changing an evolving that time really adds up; and I for one am a bit sick of the dog and pony show. These aren’t content mills either. Anyway, rant over… there are a few others on the list that I’ve never heard of. Thanks for sharing. I know exactly what you mean! You want to get credit for your great occasionally even though ghost writing can be a great way to make ends meet. I do get it and have felt the same way when writing for sites like Textbroker.